The original "Sassholes!" blog launched in 2004. Life, work, and Social Media intervened, and as years progressed, I posted less, and the last post there was in 2016. I am happy to be back and posting again here, and I hope you find bits of entertainment and inspiration. Thanks for stopping by! ​When I was in High School, over 40 years ago, one of my best friends and I were intrigued by the "TM Center" that had opened above the Hollywood Lanes bowling alley on Queens Boulevard. My friend lived in the apartment building behind the lanes, and I walked by them every day on my way to Forest Hills High School. The bowling alley was also a regular place to visit, to bowl with friends, and when I was younger, to hang out while my parents bowled with their friends in the Tuesday night league. Are bowling leagues still a thing? I wonder. What was this TM Center, I also wondered? We had sort of heard of TM because the Beatles had talked about their experiences meeting the TM founder, Maharishi Mahesh Yogi, on a journey of theirs to India. Richard (my friend) and I did some digging around (and back then that meant actually asking people questions. We did not have smartphones or Google.) Eventually, we just trudged up the wide staircase next to the bowling alley entrance that led to the TM Center on the second floor to see firsthand what it was all about. We picked up some brochures with a picture of Maharishi Mahesh Yogi on the cover, and that is how I first encountered Transcendental Meditation. A trip to the library for some more research (yes, the library, in a building - remember, no smartphones or Google...) piqued my interest enough for me to sign up for instruction. If memory serves me, as a student, it only cost $25 or $50 for the instruction (today it is hundreds). I was willing to forgo a few weeks of record buying to give it a shot. Back then we had a weekly ritual to go to the department store, Alexander's, also on Queens Boulevard, on Saturday mornings, where, for several hours each week they had their record albums on sale. Week by week I built my long-lost vinyl collection spending a few bucks on whatever new releases were on sale. So, instead of a few more LP's, I decided to spend my hard earned allowance on TM. In retrospect, it was perhaps an odd choice for a reasonably straight-laced and traditional 15-year-old kid, but something about the prospect of meditation and seeking inner peace spoke to me, and I was all in. I went through my instruction, received my mantra, and began my journey with meditation. Rather than "journey," meditation is often referred to as a "practice" and practice I did. Ever since those few days of instruction on the second floor above the Hollywood Lanes bowling alley, I have made meditation an essential part of my daily routine. I have practiced in my childhood bedroom, in my college dorms and fraternity house, on the NYC subway on the way work, on buses and trains and planes, park benches, and countless quiet (and not so quiet) corners, as I've navigated through my life. I've been pretty good about daily meditation once a day, and through various spurts and starts, have been much better at more regularly meditating a second time in the afternoon or evening, as is prescribed by the official TM training. Of course, any meditation is better than no meditation, and I feel I have reaped many benefits, even during times when I only fit one session in a day. I am generally a happy, positive thinking person, and I think meditation has helped support that mindset. I think it has kept me calm and creative, and perhaps helped to amplify that which was already within. I am sure that at times in my life when things were rocky and tough and extraordinarily stressful, I managed with meditation far better than I would have without meditation. But you don't need to listen to me to learn about the many benefits of meditation in general and TM in particular. There's lots of great information at www.TM.org and groups like the David Lynch Foundation. I also recently listened to a great interview with Bob Roth from the Lynch Foundation on the ID10T podcast with Chris Hardwick. Roth has a great way of explaining TM in simple terms, and with logical, accessible, analogies. I recommend listening to the interview if you'd like a better understanding of meditation and TM. 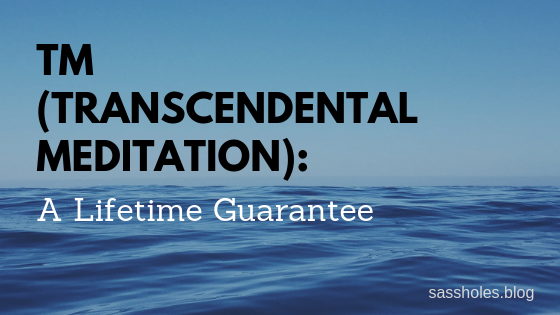 What prompted me to chime in with this little article is not to tout the benefits of mediation, but rather, as a marketer and consumer, to tout the incredible organization behind Transcendental Meditation and the fact that they offer a true "lifetime guarantee" on your TM instruction. How many times have you bought a product with a "lifetime guarantee"? How many times have you been in a position to test that guarantee? Probably not too many. I put TM to the test and was blown away by the result. A couple of years ago, as I sensed a growing interest in TM, I thought that perhaps I should consider taking a refresher course after all these years. I fully expected that I would pay for it, and went to TM.org to see what was offered in my area. Filling in a short form, I was immediately put in touch with the TM instructor nearest me, who emailed me with a few questions about where and when I had my initial training. I responded, and in less than 5 minutes I received a return email that I had been verified. "Yes, Jeff learned TM Oct. 11, 1975 in NY at age 15" and they even told me the name of my teacher. Better yet, I was surprised to learn that because I had been verified, my three-day refresher course would be free! I was amazed that they had such good records, after more than 40 years, and long before computers were readily available and in use. Now that's customer service! So, I took my free refresher course and continue to feel refreshed every day, thanks to my long-standing practice of Transcendental Meditation. After nearly 45 years I've learned that this is one case where practice doesn't make perfect, but rather, daily meditation helps you perfect the practice! Do you practice meditation? Interested in learning more? You can listen to Bob Roth talk with Chris Hardwick below. Despite the gentle teasing by meat eaters, the fact is that the number of people following a vegan diet or vegan lifestyle has been growing dramatically in recent years. According to Forbes, "The number of U.S. consumers identifying as vegan grew from 1% to 6% between 2014 and 2017, a 600% increase, according to GlobalData." In addition to actual vegans, the popularity of plant-based foods, in general, is on the rise. According to the same Forbes article, "Sales of plant-based alternatives to animal-based foods including meat, cheese, milk, and eggs grew 17% over the past year, while overall U.S. food sales rose only 2%, according to data from Nielsen and the Good Food Institute. The market for such foods totaled more than $3.7 billion." So, in today's world being a vegan is not only more common than it was when I began, it is a lot easier, with food choices far more varied and accessible. Advances in food science from companies like Beyond Meat and Impossible Foods have proven that it is possible for good tasting vegan options to be successful and available at both the corner supermarket and neighborhood restaurant. Dare I say we're on the brink of a golden age for vegans? I travel a lot for business and even as recently as three or four years ago, in many countries I visited it was not so easy to find vegan options at restaurants. 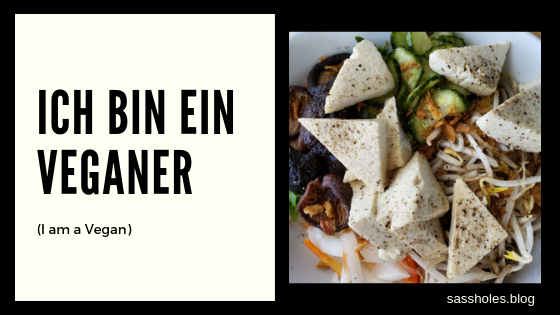 Thus, before a trip to Germany a few years back, a German friend taught me to say "Ich bin ein Veganer" to my servers at restaurants in Germany, where at the time there was rarely a vegan option on the menu. Being able to declare my veganism in the local language certainly helped, but I still found myself often negotiating with servers and chefs to get an off-menu vegan meal, as I wrote about in this article for Entrepreneur.com. Now things are a lot easier, even in Germany. As I travel the world, I can count on the app Happy Cow to recommend great vegan and vegan-friendly restaurants in just about every city I've visited. On a trip to Germany last year Happy Cow led me to Vevay, in Frankfurt, a fun and trendy 100% vegan restaurant. I posted a picture of my delicious meal there (as I am often wont to do) and it has been viewed over 40,000 times, much to my surprise. ​So, if you are considering a plant-based diet, there's never been a better time to give it a shot. Being vegan is a personal choice, and of course, it is not for everyone, but it works for me. I appreciate that it is a choice that has health benefits, shows compassion for animals, and is better for our environment - all issues that are important to me. Even if you have no inclination to change your overall diet, thanks to the growing popularity of veganism there are now some fantastic new restaurants and no shortage of plant-based options for you to try. I am as guilty as anyone of painting a picture through Social Media that I live a wonderful life. We are far more apt to share the good stuff and especially the stuff that makes us look good. It is human nature, I suppose. But the reality of the human experience is far from perfect. Like you, I have fears, anxiety, worries, stress, and a variety of problems and concerns I rarely speak about publicly, if at all. But... and it is a big but... when I balance the scale I realize that I have far more on the plus side to be grateful for, including the loved ones and others in my life. So, as one of my 2019 words, I choose to go through each day with an attitude of gratitude and approach life recognizing the things to appreciate and be grateful for in every moment. Speaking of every moment, we live in a world of seemingly infinite distraction. Attention deficit is no longer a disorder, it is the norm, as we (and when I say "we" I really mean "me" or "I") can't go but a few minutes without seeking the next dash of dopamine delivered by the beeps and buzzes of our devices (emphasis on vices...). They say we now crave experiences more than things, yet we miss the immediacy of most "experiences" while we scramble to snap, video, and post our proof of life. It is not good. I do it constantly. I am consciously trying to do it less, and be in the moment more. Now is the most important time, the moment that matters most. We are living our lives now, not later, not tomorrow, not yesterday. Now. I am here, now. My third word for 2019 is movement. In many respects, movement is the secret of life (and not just for sharks...). Movement keeps us healthy (note to self: don't sit all day!!!). Movement also means progress. Are we moving forward toward our goals? Moving forward in our relationships? Moving forward in our business and careers? Moving forward by learning and trying new things? Movement encompasses it all, and thus I want to focus on keeping moving in 2019. So there you have it, my three words for the year. My resolution, therefore, is to try and keep these three words in the forefront of my thinking and let them guide and inspire me every day. 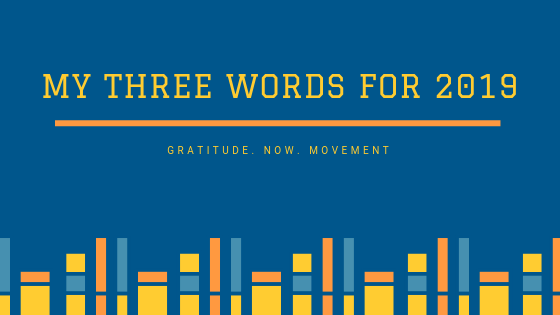 Do you have three words for the year?